One of my favorite things to do is to create super simple, healthy recipes without special ingredients that fool everyone into thinking they’re an unhealthy, time consuming labor of love. This Low Carb Strawberry Cheesecake is one such trick! Please don’t let the gelatin bit scare you off from making this dessert! For some reason, gelatin appears to be a daunting ingredient, but it’s used super simply in this low recipe, and does a lovely job of setting the filling into smooth cheesecake texture. All you have to do is sprinkle the gelatin over cold water in a saucepan (this is called “blooming,” and keeps the gelatin from developing rubbery clumps in your filling), let it sit for one minute, then turn the burner on low heat and stir to dissolve it completely. Add to your filling, set in the fridge, and boom! 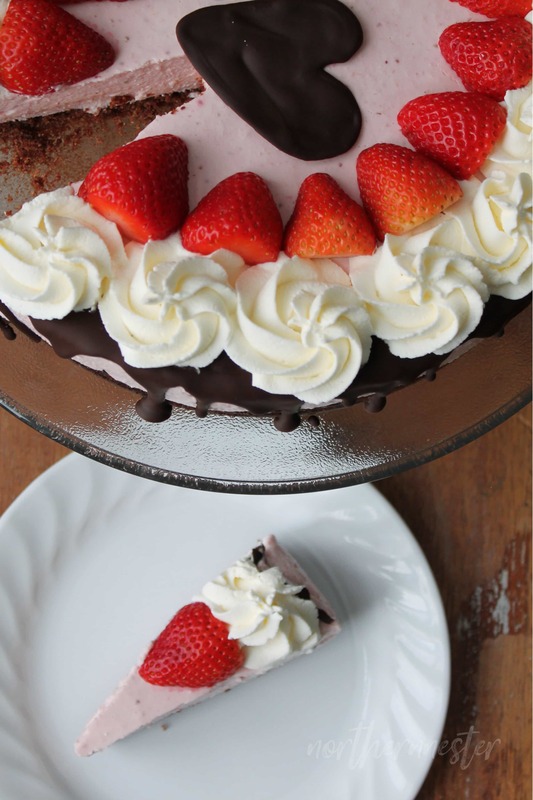 …you have a beautifully set, no-bake, low carb strawberry cheesecake! Unless it’s a single-serve recipe, I always ask my hubby and our kids to taste test my experiments, and this low-carb strawberry cheesecake is one they could not get enough of! 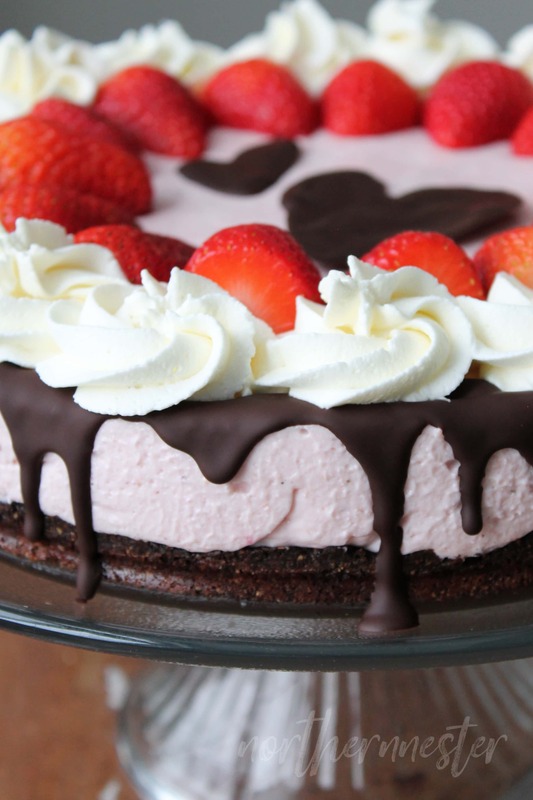 This beautiful pink, low-carb Strawberry Cheesecake couldn't possibly be easier to make! It's gluten-free, high in protein, and doesn't require any special ingredients. A THM S, Keto. To make the crust, melt butter, xylitol, and mineral salt together in a medium saucepan until sweetener is dissolved. Remove from heat. Stir in almond flour and cocoa powder. Press into a 9" springform pan. Bake for 12 minutes. Cool. To make the filling, pour cold water in a small saucepan and sprinkle gelatin on top. Let it sit for one minute to soften. Over low heat, dissolve gelatin in water, stirring often. (Water will look like normal water when gelatin has been dissolved). Puree strawberries in blender until smooth. Add in cottage cheese, xylitol, cream cheese, and dissolved gelatin. Blend until filling is light pink and smooth. Spread filling over crust. Refrigerate for 2 hours to set. Remove springform before garnishing. To make the garnish, melt chocolate on lowest heat in saucepan. Spoon over the edges of cheesecake to create a drip effect. Beat whipping cream and xylitol together until stiff. Fill piping bag with whipped cream, and pipe rosettes on top of cheesecake. Decorate with fresh strawberries. Gentle Sweet can be used in place of xylitol in half the amount, or Super Sweet in a quarter of the amount. 4 1/2 teaspoons of Just Gelatin or Great Lakes gelatin may be used in place of the Knox gelatin. « Trim Healthy Mama’s BIG Valentine’s Day SALE! Feb 5! How many carbs, fat, protein, etc. HELP! Got to count these. This really looks yummy. Beautiful also! any substitute for almond flour? Do you have an idea for a ‘crust’ if I wanted to make this into individual cups? Thanks! Making it right now, and also wondering. . . 🙂 I’ll try 1/8 tsp and see how it goes. Delicious! My whole family loved it! Thanks for another GREAT recipe! This is AMAZING. Mine didn’t turn out quite as pretty because I just dolloped spoonfuls of whipped cream instead of piping it, but it didn’t change the taste at all! I didn’t even share the batter when I was making it… just licked off the spatula and blender bowl myself. 😉 Easy to make, pretty much no-fail since it’s no-bake, and incredibly delicious. It’s our Valentine’s Day breakfast AND dessert! Thank you so much!